If you want to extend your PS4 playing beyond the living room or fancy a micro-console, then this is the device for you. But, if you are looking for an on-demand TV device please look elsewhere. Sony has been on a roll since the PS4 was released, lapping up plaudits for its console and beating Microsoft not only in the numbers game but the PR one too. While I hoped the PlayStation TV would follow this winning trend, the device is more of a wobble than a win. One of the most interesting things about the PS4 is the Remote Play functionality. Anyone with a PS Vita can currently take advantage of this, by mirroring the PS4's OS to their device. It's fun and, unlike when it was first announced for the PS3, it really works. It is this functionality that's at the heart of the PlayStation TV - a tiny box that's designed for your second television. The idea is that you connect it up and it allows you to play the PS4 on another screen, when your primary telly has been taken over by a significant other. The issue Sony has with this device is that it could and should be so much more. It is a TV streamer and a mini games console as well, but these functions feel more like an afterthought. This makes the PS TV feel, well, undernourished. 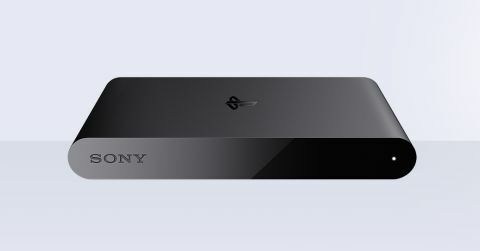 One thing I couldn't fault was the look and design of the PlayStation TV - it's tiny but a beautiful piece of kit. Measuring just 66 x 104 x 127mm, this is one of the dinkiest micro-consoles on the market and something that will slot into any existing media setup with the minimum of fuss. The majority of the inputs are situated on the back of the PS TV. Here I found the HDMI in, ethernet port, a power switch and expandable memory slot. If you are hoping to use the PlayStation TV as a dedicated gaming device and not to simply stream PS4 content, then you will definitely need more memory. There's 1GB on on-board storage to get you started, though. It takes no time at all to set up the PlayStation TV. Open the box and what you get is a power plug, HDMI cable, the console and downloadable game pack. That's right, Sony is making sure that you can have fun with this device straight away by bundling in three games: Worms Revolution, Velocity and OlliOlli. I would love to say that I enjoyed all of the games, but only Velocity Ultra and Worms Revolution worked on my review unit - more on game compatibility issues later in this review. Once I plugged in the PlayStation TV in, the setup was simple. The device prompted me to choose a WiFi connection or opt for LAN, then I was asked to sign into the Sony Entertainment Network. Once done, it then asked me to make sure I adjusted the screen so the screen didn't bleed out of the edges. The operating system used by Sony for the PlayStation TV is exactly the same that is used for the PS Vita. I have nothing against the Vita OS but it's meant for the small screen. Put it on a TV and its foibles are amplified. It's a shame that Sony felt that the OS could go straight on the device as it definitely needs to be modified. Given the Vita uses a mixture of touchscreen and analog controls, just using analog controls feels strange. Little things like being able to swipe out of one screen and into another is now done with a rather clunky holding of the O button. Vita owners will be right at home with the navigation of the PlayStation TV but for everyone else, it just isn't that intuitive. Thankfully it is simple so if you do get lost, a press of the PS button on your controller will get you back to the main screen.